Can I get Financial Aid at Hallmark University? Yes. Hallmark University is approved for federal financial aid, scholarships, and U.S. veterans benefits. Yes, Hallmark is accredited through the ACCSC(Accrediting Commission of Career Schools and Colleges). How long are your class semesters/terms? Our terms are 8 weeks long. This allows us to have 6 terms a year so there is no need to wait to apply. Is Hallmark a 2 year or 4 year University? We offer associate, bachelor, and master level degrees. We are not a trade school and we offer degrees which are found at both 2 year and 4 year colleges/universities. The biggest difference is that our degrees can be completed in nearly half the time of traditional universities. Higher education needs to change. Students are facing a number of challenges with today’s universities that are leaving them in tough situations. Hallmark University is setting out to change higher education by demonstrating a better way. In addition to our lower net price, our shorter program length allows graduates to spend less time in school and more time in the workplace earning an income. Our degrees let our graduates finish in nearly half the time. At Hallmark University you can earn your associate’s degree in just over one year and your bachelor’s degree in just over two years. This is more than twice as fast as the national average completion time for each degree level. Out students have the opportunity to apply their knowledge with scenario-based education. All of our programs integrate real-world scenarios into the classroom so that when you graduate, you are ready to face workplace challenges. Having job experience through hands-on training gives our graduates an advantage when entering the workforce. Our programs are designed around high demand industries to help graduates find employment. We only offer degree programs in four areas of study for a reason; we want to be the best at what we do. We take a quality over quantity approach to ensure that every program we offer reflects a high level of expertise and strong graduate outcomes. We are committed to developing the whole person. We have developed our own character training program that instills 7 charater traits into each and every student at Hallmark University. Character training scenarios are injected into their courses s they have an opportunity to see how it applies to their career. *Based on data from https://collegescorecard.ed.gov. At Hallmark University, we are committed to changing higher education by making it more accessible and more affordable. With our competitive tuition rates and compressed degree duration, you are able to spend less time in school and more time in your career making money. We understand how expensive book feed can be at other universities, so we package them together so you can focus on what’s important – your education. By utilizing compressed objective driven courses, you can complete your education in close to half the time of a similar program at a traditional college or university. This speed enables you to start your career much sooner and ensures that the concepts you learn will still be relevant when you graduate. Receiving the scholarship from the Baptist Health Foundation allowed me to cut down on my education expenses and it has motivated me to give back. Financial planning is integral when preparing for college. Many students do not realize is the availability of scholarships and privately funded grants. We can help. Our Student Financial Planning Office is ready to assist you in completing all documents applicable to the various federal, state and/or private sources of student financial aid. Our Student Affairs’ team diligently works with industry leaders to assist the student in securing employment after they graduate with a department goal of 90% placement within 90 days of graduation. At most 4-year universities, students are hoping to finish their Bachelor-level degree in 48 months. Unfortunately, this happens much less often than some might think. Though most programs are projected to finish in 4 years for full-time students, most students do not stick to this timeline. In fact, the average amount of time most students finish 4-year degrees is 58.8 months, nearly 5 years! We take a unique approach to curriculum delivery, which enables our programs to be delivered in nearly half the time as other 4-year universities. Instead of the normal 2-semester year, Hallmark students learn in six 8-week terms, with minimal breaks. In today’s fast-paced economy, students want their knowledge and experience to still be relevant when they graduate. Our accelerated programs enable our graduates to hit the ground running by utilizing the same training they will see in the workforce. At Hallmark University, the fast pace really prepares you for being a nurse. You have to have the mental and physical fortitude in able to work fast. The program’s fast pace really helped a lot. Finish on time at Hallmark. Hallmark’s unique education tracks and student success advisors help students stay motivated to finish on time. At other universities, students can add an extra 70% in debt by finishing just 2 years behind schedule. Every program at Hallmark University has engaging, real-world settings for classrooms. Students learn in Server Rooms, Hangars, Hospitals, and Boardrooms. Too many students are graduating from other universities without hands-on experience in their area of study. Lectures held in large auditoriums prevent the student from developing the real-world skills demanded by today’s workforce. Our curriculum integrates scenario-based experiences in every program. 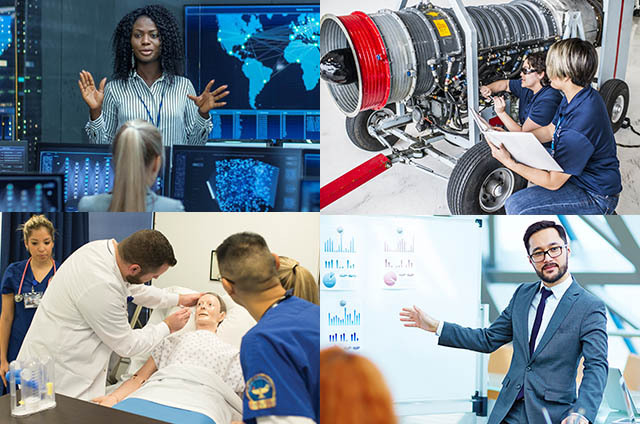 Solve real case studies, work on real servers, fix real jet engines, and run real-time simulations in medical labs. We are here for each and every student as they face challenges and find success. Out Student to Faculty ratio allows our instructors to give students constant, personal help and attention. When you graduate, you will be ready for your career as you have been working in a similar environment to what you will find in the workforce. This is one reason why employers say they love Hallmark graduates. We’re at a point right now where talent is limited. Hallmark has probably provided us the most combat-ready individuals. All of these programs have direct career outcomes that students are working towards. Comparing the median annual income in all occupations, these areas of study are greatly exceeding the national average. A recent study published in The New York Times shows that Hallmark University is one of the best universities at moving their students up two or more income brackets. In San Antonio, nobody beats Hallmark University at helping people move up in their income. No other private, nonprofit university is seeing the radical change Hallmark is having in its graduates’ income. Hallmark is one of the top in the nation for all private, nonprofit universities at proving its success for graduates. Our degrees are designed to lead students to a number of industry certifications that employers tell us they are looking for in graduates. Many certification tests are covered by tuition. Of these, 90% are available to be taken at Hallmark’s on-site testing facility. Hallmark University is committed to the success of every graduate that comes through our doors. To show our dedication, we have an institutional goal of placing 90 percent of all graduates in the career field of their area of study within 90 days of graduation. We are able utilize our industry partnerships and career placement services to perpetually maintain this level of success. In addition to Service Projects and Community Outreach, we integrate the Hallmark Character traits into our curriculum. These traits provide industry with a valuable human resource and provide the graduate with excellent professional opportunity and soft skills. When we ask employers who hire our graduates, “What’s the main thing you’re looking for?” The #1 answer we get is always the same. Employers want character. Every program integrates ethical decision-making scenarios into the curriculum. Hallmark graduates emerge with a strong sense of leadership and integrity. Our Hallmark students have told us just how impactful the Hallmark Character program has been in their lives. Our customers notice the Hallmark Alumni have the technical skills, the people skills, accountability, reliability, and dependability.